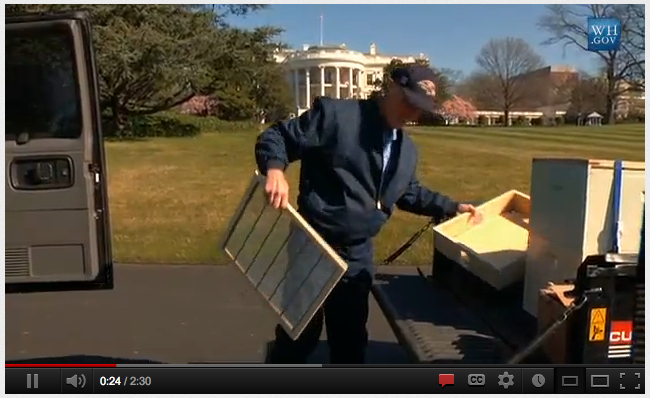 First ever honeybee hive is installed at the White House! With the heated political environment these days, the last thing we wanted to do is go anywhere near the topic. But we did stumble upon one cool thing that does deserve some support and viewing. So Republicans, Democrats, Libertarians and Greens, lets all put our differences aside for a few minutes and watch a video highlighting the White House honeybees and their hive. Certainly something we all can agree upon, the support of the honeybee population. Hey! Just in case you are a beer lover (Brand Foreman is) take a look at this video too. This entry was posted in Government, Hives, Honey, Honeybees and tagged hives, Honey, Honeybees, White House by beerancher. Bookmark the permalink.